Whether you're at home or at work, load your monthly pass or e-wallet onto your Multi card online! More details. The Société de transport de l’Outaouais (STO) offers a range of fares to match how the services are used and rider status. Student, senior, child or adult… whether you take the bus often or just once in a while, there is a fare that suits your needs. On the menu on the left, select the rider category that best matches your profile to learn more about the types of transit passes, tickets and fares available. 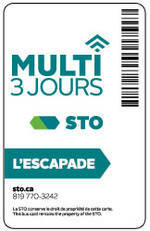 If you plan to travel frequently on the STO system, get the Multi card to take advantage of the passes that can be loaded on it. Passes are not refundable after their start date. If you only take the bus occasionally, the options below are the best ways to pay your fare when boarding the bus. When paying your fare with the e-wallet, you are automatically entitled to an e-transfer that is valid for 2 hours starting from when you first boarded an STO bus. When paying your fare with a paper ticket or cash, you must ask the driver for a transfer when you first board the bus. Offers an e-wallet allowing you to pay your fare (as you would with a paper ticket). You can get your Multi card only at one of the service points for $8 (non-taxable). To obtain a card, an ID card with photo is required, such as a health insurance card or driver's licence. Once the Multi card has been issued, it can be recharged at any time at one of the service points, one of the recharging sites or on line in My Profile. If your card is lost, damaged or stolen, go to one of the service points to get a new Multi card and its contents for a fee of $10 (non-taxable). If your card had no cash value, a fee of $8 (non-taxable) is payable. If your Multi card is defective, it will be replaced at no charge. Save 10% on the price of a monthly pass with the FIDÉLITÉ Program. This annual pass purchased by pre-authorized monthly debit payments is practical because it allows you to travel on the system without worrying about renewing your pass. Click here to discover the advantages of the FIDÉLITÉ Program and to enrol! Unlimited travel for the entire month! The monthly pass is loaded on the Multi. It gives you unlimited travel on the STO system for the entire month (from the first to the last day of the month). It is ideal if you take the bus often in a month. You wish to get a monthly pass for the first time? Check the conditions for obtaining a Multi before you go to one of the service points to get a Multi on which your pass will be loaded. You already have a Multi? You can recharge the card at any time at one of the service points, one of the recharging sites or on line in My Profile. You can even recharge your pass for several months. Avoid the line-ups and recharge your card before the end of the month. Simple and easy to use, it can be loaded on your Multi card at your usual retail outlet or on line in My Profile. You can pay your occasional trips by means of an e-fare. You can put from $10 to $110 in your e-wallet. A fare debited from your e-wallet entitles you to an e-transfer that is valid for 2 hours starting from when you first boarded an STO bus. Simply pass your card in front of the reader again during the validity period and the transfer will be accepted. See the Frequently Asked Questions for more details about the e-wallet. Simple and easy to use, as its name suggests, this pass is ideal for occasional trips! It's an e-wallet on a non personalized Multi card. Wich means it's transferable and it can be shared easily among riders in the same family. No matter who uses it, the Occasional Multi lets you pay for your trip using an e-fare. It can be loaded at the service points and retail outlets. The Occasional Multi is the Multi that lends itself well! A fare debited from your Multi entitles you to an e-transfer that is valid for 2 hours starting from when you first boarded an STO bus. Simply tap the reader again during the validity period and the transfer will be accepted. The Passe-temps gives you unlimited travel for 24 consecutive hours for ony $7.00. It is automatically activated when first validated on an STO bus. Once activated on an STO bus, you can use it as often as you wish on STO and OC Transpo routes during the card's validity period. it is non-refundable if lost or stolen. Get unlimited trips for 72 hours for only $20. It is easy to use! When you first board an STO bus, just pass your Multi card in front of the reader. Once the card is activated on an STO bus, you can use it as often as you wish on STO and OC Transpo routes during the card's validity period. The paper ticket allows you to take occasional or spontaneous trips. The ticket is accepted without a supplement on all STO routes. Tickets are sold in booklets of 6 tickets. To accommodate their customers, some retail outlets have taken the initiative to sell single bus tickets. However, this type of service cannot be expected from all authorized ticket outlets. When fares change, tickets in circulation are accepted as long as riders pay the cash supplement to make up the difference between the old and new fare. Cash fare is a practical solution when you have to take the bus unexpectedly. The exact fare in change is required. Pennies and bank notes are not accepted. Save on occasional travel by using the e-wallet. If you need to take more than one bus to reach your destination and are not using a Multi card, ask the driver for a transfer when you first board the bus. You will not have to pay with an additional ticket or cash fare to take another bus. The transfer is valid for 2 hours calculated from the time the bus leaves the terminus on the current trip.